The West Midlands Golf Club near Solihull are the latest sponsor to swing their support behind the upcoming British Indoor Finals, with major sponsorship of the event, which races into Coventry on 2nd and 3rd January 2016. Following a pitch from Joe McLaughlin, the West Midland Golf Club immediately agreed to support the finals at the Sports Connexion, Ryton. They are to provide significant financial support to the event. Owned by former Coventry Bees Speedway star John Harrhy, the West Midlands Golf Club is set in 234 acres of rolling countryside between the up-market commuter villages of Meriden and Balsall Common. It opened on 1st June 2003 and it sits in close proximity to the National Exhibition Centre. The full 18-hole golf course includes several holes which require navigation on approaches to greens over water, including the picturesque 18th green, which is set upon an island. The picturesque West Midlands Golf club. The West Midlands Golf Course is complemented by `The Lake at Barston Restaurant`, which overlooks the Barston Lake. The complex also contains full conference and party facilities. The management company also have a sister golf club, the Widney Manor Golf Course, in Solihull. All the venues and facilities are a family run business, directed by the Harrhy family, including John`s sons, Mark and Nigel. John Harrhy was also a top Cycle Speedway rider in Coventry before progressing to Speedway with the famous Coventry Bees. He was a star heat leader performer at the pedal sport and won several major individual events. 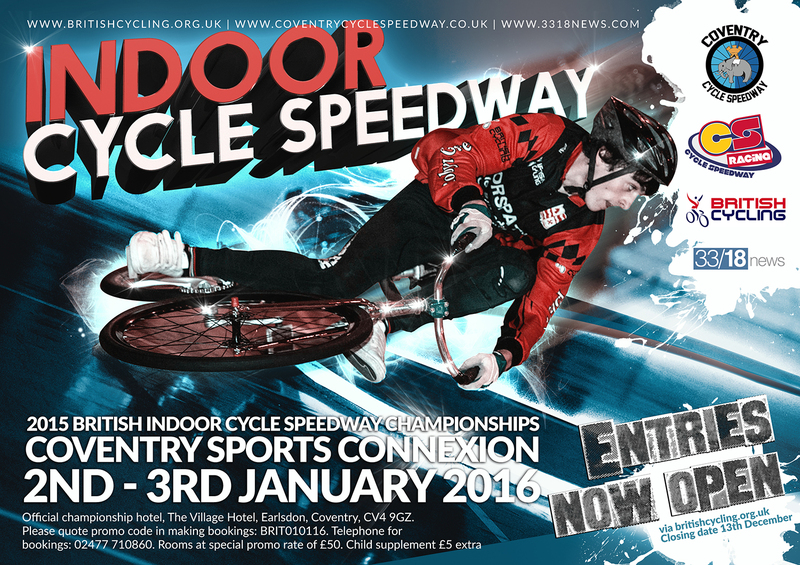 John said: “I was very pleased to hear from Joe that Cycle Speedway is enjoying such a revival in Coventry. His enthusiasm was infectious and it reminded me of some great times racing Cycle Speedway. I am delighted to support the British Indoor finals”. Current Coventry Cycle Speedway club chairman Dave Foster, a 1960s era Cycle Speedway rival of John Harrhy, said: “We are delighted to have John and the West Midlands Golf Club on-board for the British Indoor finals”. There are still limited spaces left for late entries to the British Indoor Finals. These are in the British Under 13s Final, British Woman`s Final and British Veterans Final. There is also one space left for the British Senior Team Final and two places left in the British Junior Team Final. Riders, management, officials and fans can book hotel accommodation at the official championship headquarters, the Village Hotel, Coventry, for Friday 1st January 2016 (ahead of the first days racing on the Saturday), Saturday 2nd January 2016 and Sunday 3rd January 2016. To reserve your hotel room for the 2015 British Indoor Finals events could not be simpler. Just call: 02477 710860, select option one, then select option 2. Please then quote the dates and hotel (Village Hotel, Coventry) you wish to stay at and then quote reference number: “BRIT010116″.